We Studied 6,713 Holiday Marketing Emails - See the Results! With an average of over 122 billion emails sent and received every day, it’s not surprising that 71% of that is mostly spam. In general, it’s fairly easy for us to sift out the junk from the messages that matter. We can use custom labels or spam filters, and the subject lines are often dead giveaways. The less “corporate” the message, the easier it is to differentiate. The line between junk and “good” email gets a bit murky as we start mixing in persuasive messages from the brands we know and love. Brands heavily rely on email marketing to connect with us and keep us interested and updated on new products or services. It’s not as if commercial emails are bad. If Nike is our favorite brand, we probably don’t mind getting promotional emails from them. But what makes a commercial email good? What are the ingredients of an email that guides us from our inboxes to a product page? For your convenience, click on any of the descriptions below to jump to the section and check out the data. If you just want to see the main takeaways, click here. 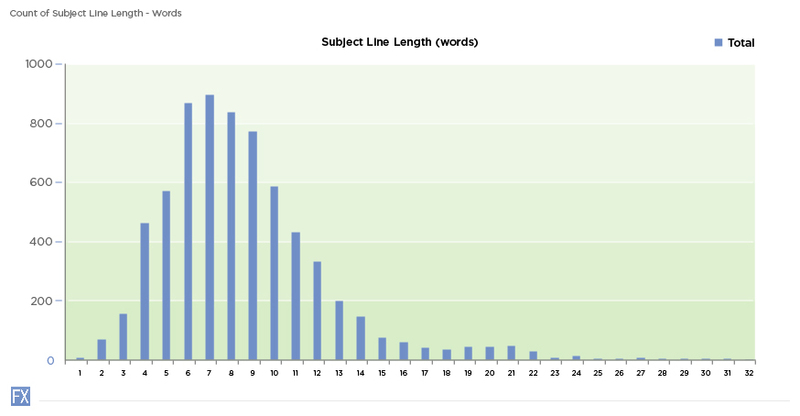 The most common number of words used in our sample size of subject lines was 7, closely followed by 6, 8, and then 9. This range has also been verified in many other email marketing studies. Muadhu Gulati of ShowMeLeads noted a 21% open rate for subject lines between 6-10 words, reducing to only 14% for subject lines with 11-15 words. 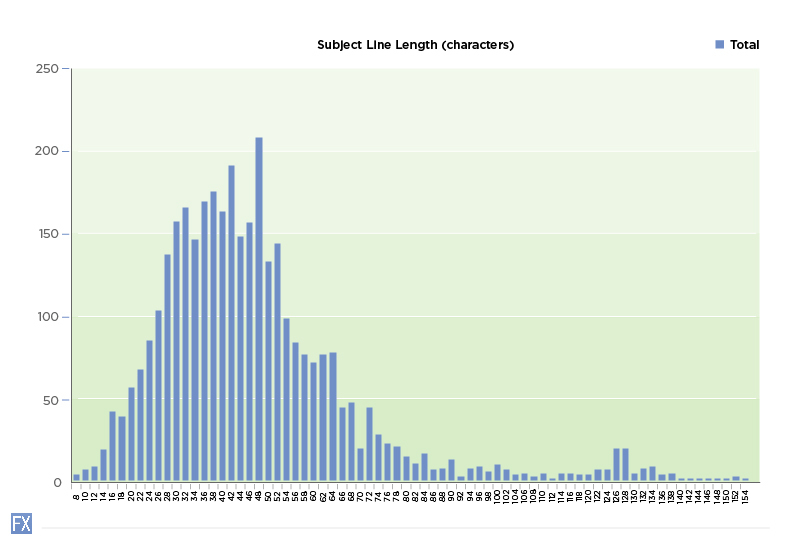 The most common number of characters used in our samples size of subject lines was 48 characters, closely followed by 39, 37, and then 42. Keeping character counts in the range of 36 – 50 characters helps keep subject lines from getting cut off in most inboxes. Takeaway: Try keeping your subject lines between 6-9 words and 36-50 characters. MailChimp, one of the leaders in email marketing software, analyzed 12 billion emails in 2012. They saw that as subject line characters counts neared and exceeded 50 characters, open rates decreased, ultimately becoming stagnant up to 140 characters and more. While the post itself raised eyebrows, many commenters noted how most email readers have character display limits, which is why longer subject lines don’t necessarily add value. They may even be devalued because they get clipped off by inboxes. 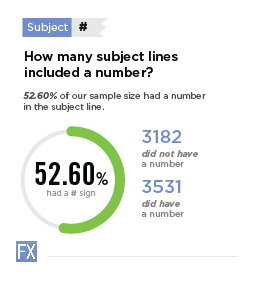 The most commonly used word in our sample size of subject lines was off, followed by your, free, and today. The patterns we noticed are two instances of direct acknowledgements, two instances of urgency, as well as five instances of monetary incentives. While these were the most common words used in our sample size, many others have confirmed similar word choices and phrases. The guys and gals over at Buffer compiled a list of 189 words that convert which also include the phrases above. Takeaway: Mentioning “% off” was the most frequently used attention-grabbing strategy. Consider using a mix of urgency words and incentives for subject lines that convert. We analyzed the subject lines in our sample size for a variety of special characters. How many subject lines included a number? 52.60% of our sample size had a number in the subject line. How many subject lines included a dollar sign? 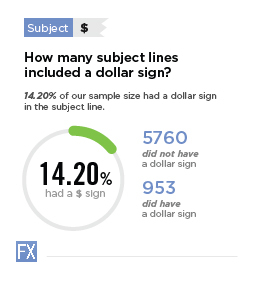 14.20% of our sample size had a dollar sign in the subject line. How many subject lines included a percent sign? 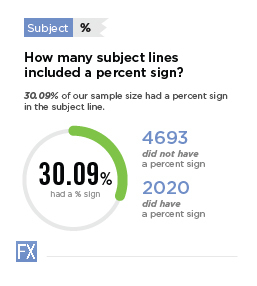 30.09% of our sample size had a percent sign in the subject line. How many subject lines included an exclamation point? 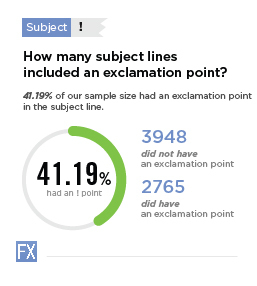 41.19% of our sample size had an exclamation point in the subject line. How many subject lines included a question mark? 3.49% of our sample size had a question mark in the subject line. We also checked to see how many emails were personalized, since we signed up for these emails with a name. To our surprise, only 60 out of 6653 emails actually used our name! That means 99.11% of the emails did not use the names of their subscribers in these marketing campaigns. One of the major reasons for this is because many of the email sign-ups did not actually require us to enter a name. This shows that brands aren’t placing too much significance on collecting names, just our email addresses. Takeaway: Try using numbers in tandem with monetary incentives and urgency phrases, such as 6 hours left and 40% off. Interestingly, it seems many companies neglect personalizing their emails with subscriber names, along with neglecting subject lines in the form of questions. Using either of these strategies could give you an opportunity to stand out. 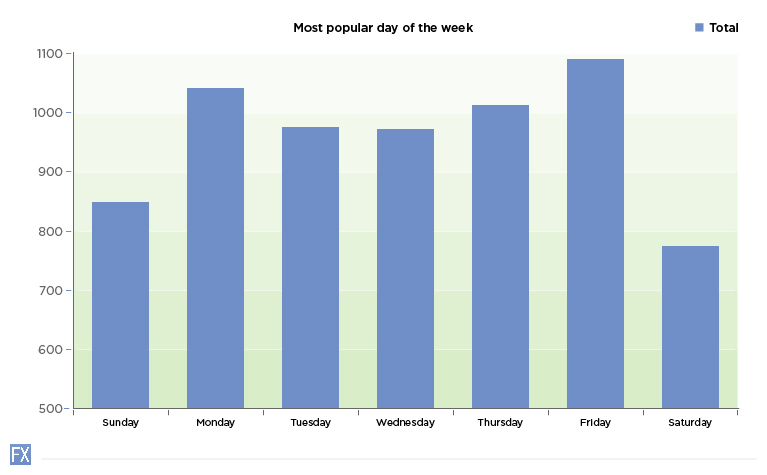 The most popular day to send emails in our sample size was Friday, followed by Monday, Thursday, and then Tuesday. Note that our sample size was collected during a 90-day period including Black Friday and Cyber Monday, which accounts for a slight boost to those days. Takeaway: From our sample size it seems the beginning and end of work-weeks are the more popular times to send emails, with weekends receiving about 44% less attention. On average, each company sent one email every other day, spreading them out over the typical 5-day work week. 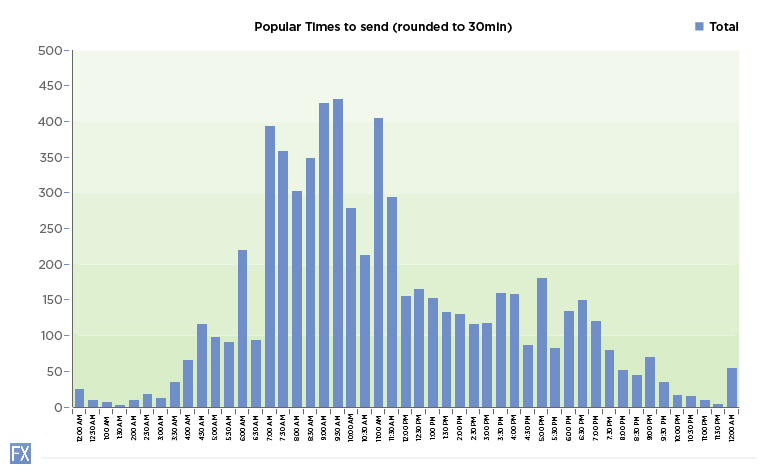 The most popular times to send emails vary slightly depending on the day, but there is a clear pattern showing mornings as favored times to send. Sunday through Saturday: most common times to send are between 7:00 AM and noon. 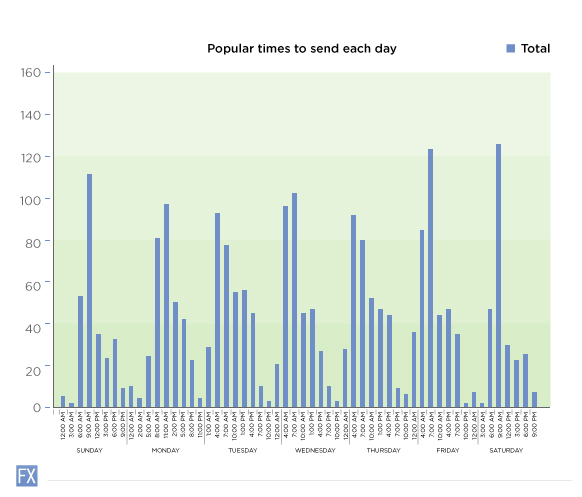 Peak time is 9:00 AM, which accounts for 7-9% of send times for daily emails. After noon there is a dramatic dip in frequency, followed by a small resurgence in the evening, around the time people get back from work and school. The number of times emails were sent during the 7-noon time block in our 90-day sample size accounted for just over 53% of all times sent. Takeaway: Try sending emails in the 7:00 AM – noon time slot to reach people during their morning routines. Try scheduling follow-ups in the 4:00 PM – 8:00 PM time slot to reach people as they return from work and school. 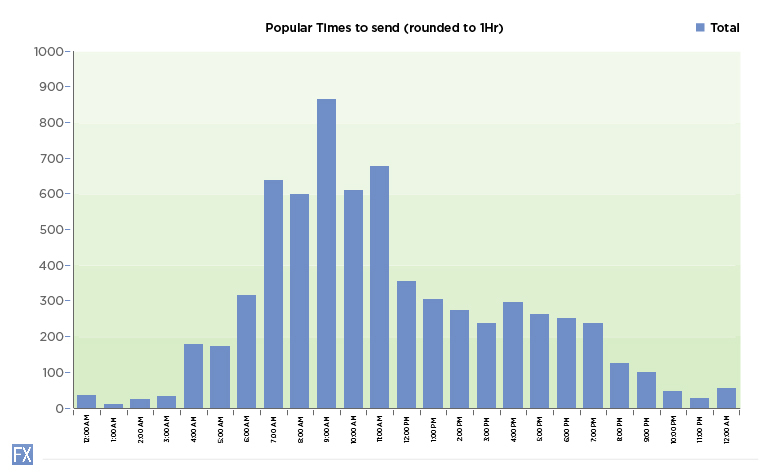 Out of our 90-day sample size, the most popular day to send emails was on 12/1/14, Cyber Monday. This was followed by 11/28/14, Black Friday, and pre-Black Friday sales two days prior. Takeaway: Try sending anticipatory emails leading up to a big event or holiday. This utilizes the tactic of effective frequency to keep your brand top of mind. Try keeping your subject lines between 6-9 words and 36-50 characters. 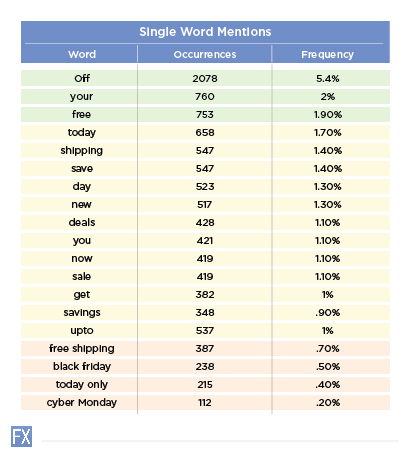 Mentioning a “% off” was the most frequently used attention-grabbing strategy. Consider using a mix of urgency words and incentives for subject lines that convert. Try using numbers in tandem with monetary incentives and urgency phrases, such as 6 hours left and 40% off. Interestingly, it seems many companies neglect personalizing their emails with subscriber names along with neglecting subject lines in the form of questions. From our sample size it seems the beginning and end of work-weeks are the more popular times to send emails, with weekends receiving about 44% less attention. On average, each company sent one email every other day, spreading them out over the typical 5-day work week. Try sending emails in the 7:00 AM – noon time slot to reach people during their morning routines. Try scheduling follow-ups in the 4:00 PM – 8:00 PM time slot to reach people as they return from work and school. Try sending anticipatory emails leading up to a big event or holiday. This utilizes the tactic of effective frequency to keep your brand top of mind. We thought it was odd that companies aren’t placing more significance on requiring names, with only 0.89% of our sample size actually making use of the names that were collected/required to sign up. 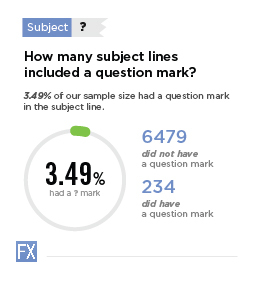 It was also surprising to see that only 3.49% used question marks in the subject line; we’ll have to run some split tests to see how well questions convert. Which data points surprised you? Did you learn anything new from our research? Let us know what you think in the comments, and if you found this post insightful or helpful, please share it!